Until this week, we were having a rather unsettled spell of weather on Mallorca, with some much-needed (unless you were holidaying here) rain and some thunderstorms. The Boss and I quite enjoy watching a dramatic storm – and we do get a few – but we are always wary about the damage that an electrical storm can do to solar power equipment. We have bitter experience, having suffered an invertor failure a few years ago during a particularly bad storm. The invertor was only three weeks old – and had cost a huge amount of money – so we were relieved to learn that the (expensive) repair was covered by our household insurance. And that our solar power system engineer would lend us an invertor until the repair could be done. When he came back with our fixed original invertor, he recommended that we switch off all our system equipment during future storms. So we now keep a weather eye open (pardon the pun) for any thunderhead clouds on the horizon or distant rumbling, and switch everything off if the storm arrives. This is fine during the day but, at night, it means somebody (and it’s always The Boss, because he’s gentlemanly like that) has to get up, go outside and dash down the field to the dependencia, where all the equipment is housed, to switch everything off. So thunderclaps at night don’t only wake us up, they can get us up too. 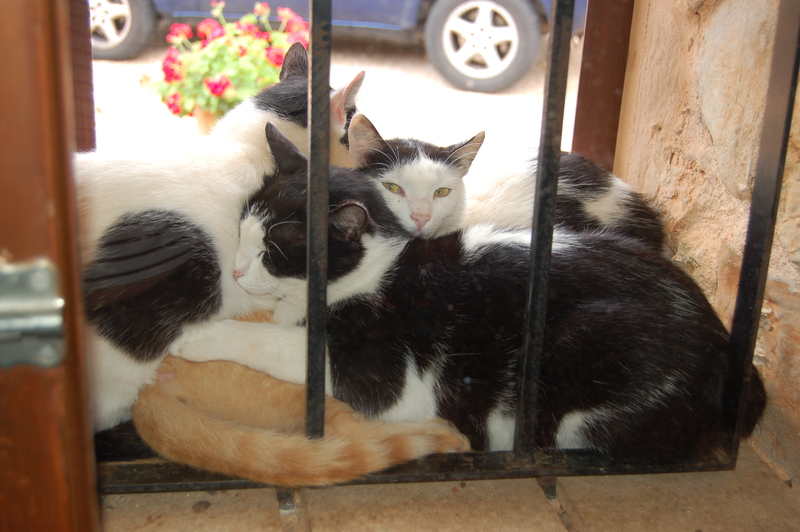 Four of our adoptees huddled in the window recess. Underneath three of them is little Peanut! Hopefully last week’s overnight storm will be the last for a while. This week we’ve had temperatures in the low 30s (Celsius) and plenty of sunshine. Our cats disappear after breakfast to hide themselves from the heat – whereas, in stormy weather, they often like to gather together in the outside recess of our dining room window. As you can see, from a photo I took during last week’s bad weather, the pale ginger Peanut – the youngest of our adoptees – has been accepted by the rest of the family . . . even if it is only as a willing pillow! ← Things you can make from stone . . .
Have you had your system properly grounded? This is the most important step to protect from lightning damage. Also to have surge arrestors on the invertor. As the invertor is an expensive piece of equipment one would expect that surge arrestors should be integrated in the design. Unfortunately this is often not the case. Continuing: not a satisfactory solution in a long time perspective. Thanks for your comment. I’d like to think we’ve had our system properly grounded, but the incompetent idiot who installed the system initially probably didn’t do this. You’re quite right about it not being a satisfactory solution in a long-term perspective. A job to add to the ever-growing list, I guess!